I have always been an avid horse lover - riding them is my favourite thing to do, but just being around these gorgeous animals is enough. 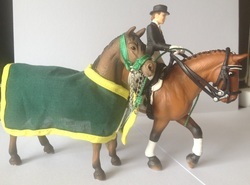 I can't afford my own just yet, so I instead fill my shelves with a dream stable of beautiful horses and ponies. This is very much an investment piece. 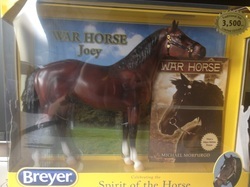 Joey is the official model of the titular horse of the same name from Michael Morpurgo's book and the subsequent Spielburg film, War Horse. The book describes the life of a horse named Joey, from his humble beginnings in Devon, to his time on the Western Front as a military horse during World War One. 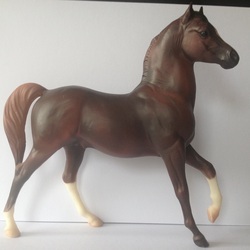 This model perfectly captures the beauty and strength of the on-screen Joey, and is a beautiful addition to any collection - he's one of only 3,500 in the whole world. This is Prince, the classic Arabian stallion. 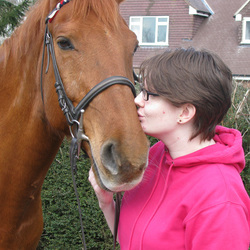 He's got a beautiful head and neck, sporting a deep brown coat and three white stockings with a white blaze on his face. 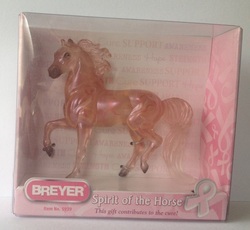 A fantastic addition to any collection, but especially if you like Arabian horses. 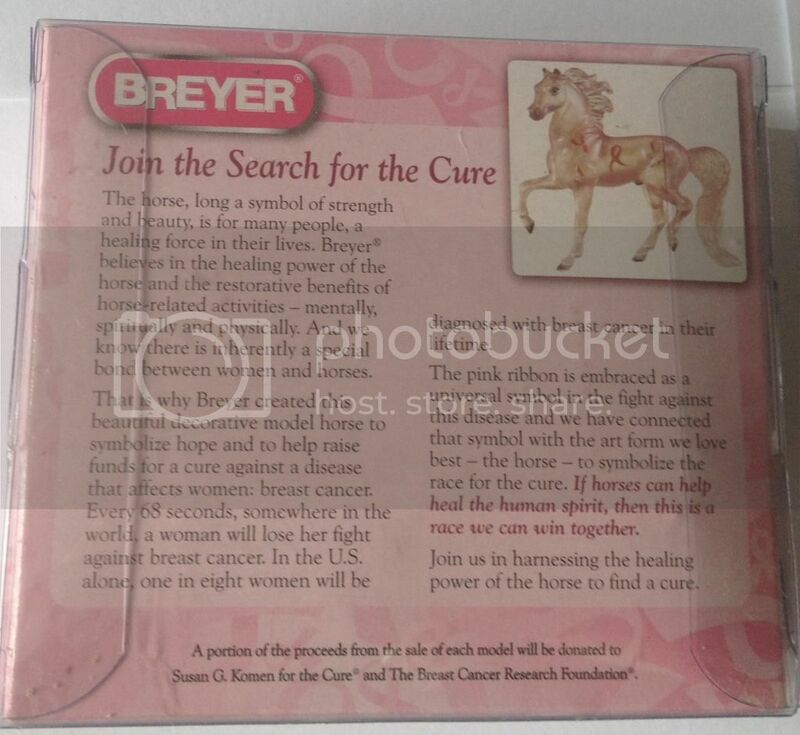 This horse was made to raise money for breast cancer research. You can see the information on the back here. 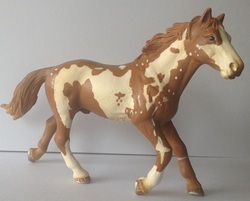 A beautiful chestnut pinto stallion, with large splash markings and a pair of white socks. Named for a character from an old western. 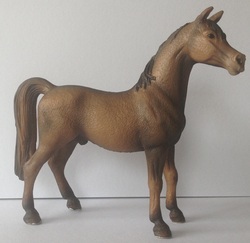 A dark brown solid Arabian stallion (quite rare in the breed), with darker points. Name meaning: Sublime. 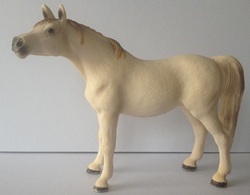 A perlino Arabian mare, with pinker points. Name meaning: Graceful. 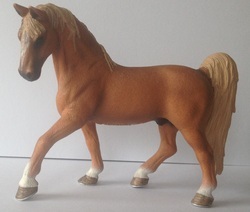 Tennessee Walker Stallion, "Jack Daniels"
A flaxen chestnut stallion, with socks all round and a white blaze. Named for the sour mash Tennessee whiskey, Jack Daniels. 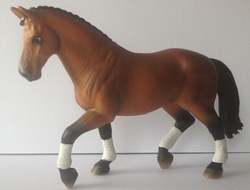 A bay Hanoverian stallion, in dressage or polo wraps, with his mane plaited ready for a show. Named for a schoolmaster dressage star I know. 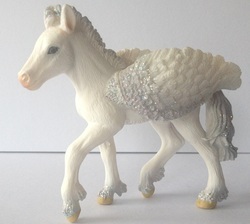 Illumia is a white foal, with sparkling grey wings and a heart-shaped mark on her back. I initially picked this up to repaint, but I kind of fell in love with it, so it's staying as it is. 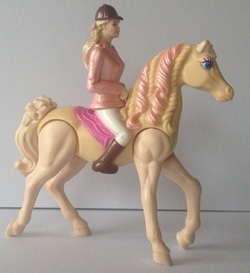 The horse has pink metallic ringlets to match her rider's pink jacket, and all four legs are poseable at hip or shoulder.